Conducting a Firstbeat Lifestyle Assessment gives an individual a better understanding of how their body is reacting to the lifestyle and routine they are living. By measuring periods of stress, physical exercise and recovery through Heart Rate Variability (HRV) and presenting the data in an easy-to-understand report, the idea is to encourage individuals to introduce behavior changes which will boost their well-being and allow them to reap the rewards in areas of their personal and work life. Used in a corporate well-being setting, the Lifestyle Assessment also gives company management or HR concrete information on which to base their wellness strategies; as it is possible to conduct group reports that contain aggregated and anonymous representation of a group. Individuals within the organization, meanwhile, receive a private and confidential report which helps them identify areas they could focus on to better manage their stress and well-being. For instance, an individual in a high-pressure leadership role may go into the measurement complaining of feeling stressed. Data from the Lifestyle Assessment can show this to be accurate, but it can also highlight things the individual is doing that are exacerbating the problem. These could include drinking alcohol late in the evenings to unwind, or not getting enough good quality sleep as they check emails before bed and wake up early to head to the office. The online journal maintained during the three-day measurement makes this possible as individuals keep track of what they did throughout the day (a big work presentation, at the gym, out for dinner, watching TV etc.). Seeing objective data which indicates a few glasses of wine before bed has led to poor overnight recovery and a depletion of the body’s resources can lead to a post-assessment goal to cut back on alcohol in the evening in the hope of improving stress and recovery balance. This is a positive first step, but how can we know for sure that such a goal has led to meaningful change for that individual? That is why conducting a follow-up Lifestyle Assessment further down the line can be extremely beneficial. Not only does it give the individual more data on which to base lifestyle decisions, it can help verify whether changes made between the original and follow-up measurements are having the desired effect. This is valuable for the individual and for wellness professionals using the Lifestyle Assessment as part of a wellness program or with individual clients. An example follow-up report shows how an individual’s sleep and recovery have altered over time. This can help show that changes made between measurements are leading to positive change. This follow-up measurement process is something many organizations employ when incorporating Firstbeat Lifestyle Assessment into their wellness or productivity programs. Manpremo is one such organization. Based in Denmark, Manpremo work with individuals and organizations to develop behaviors that create sustainable productivity. To achieve this sustainable productivity, they develop the “competency to change and the capacity to be productive”. Manpremo do this through programs or projects where behavior change is the key to success. These programs are tailored to organizations’ needs and typically run for between 3-12 months. 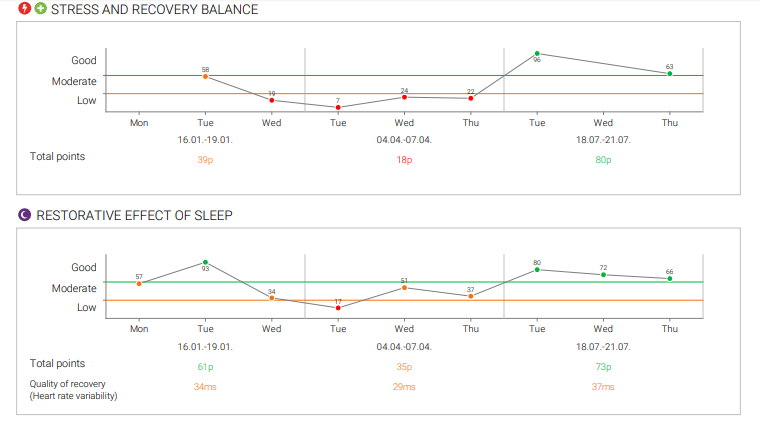 Manpremo use the Firstbeat Lifestyle Assessment to identify the physical needs (amount of sleep, ideal stress-recovery balance, etc.) required to create the capacity to change and be productive. They combine Firstbeat data with confidential data on how people spend their time at work and who they spend that time with. This helps provide a data-driven approach to individual and organizational transformation. “In the 6+ month duration programs, we use the Lifestyle Assessment twice,” explains Manpremo co-founder Jason Howlett. “Once within the first month, which we call the discovery phase. We then enable individuals to experiment with new behaviors and validate if they work, while tracking their own progress. And they’ve seen some fascinating results when comparing the initial and follow-up measurements. In a recent 23-person Learning & Development program that Manpremo oversaw in one company, a second Lifestyle Assessment conducted six months after the original showed that the average recovery experienced during work time had increased by 56-percent (from 23 minutes to 36 minutes), reaching the optimal range for recovery at work (+30 minutes). Meanwhile, the average ‘moderate’ and ‘good’ physical activity experienced-per-day had increased by 33-percent. This was a positive sign because both daytime recovery and improved physical activity have been shown to improve the capacity to be productive in the workplace. Being able to find time during the day where your body is in a state of recovery physiologically, rather than stress, can improve decision-making and help you keep on top of tasks, boosting productivity in the process. Meanwhile, recent studies have shown that increasing physical exercise can impact everything from creativity and concentration, to mental health. These results served as positive reinforcement for those taking part in the program whilst helping Manpremo confirm their methods were effective. Individuals saw definitive evidence that changes made, in part, due to results of the original Lifestyle Assessment led to positive outcomes (seeing is believing). Using the Lifestyle Assessment towards the beginning and the end of a program helps quantify the overall impact of the program. Detecting the most impactful behavior change near the start focuses effort and provides a seeing-is-believing experience based on one’s own data rather than generalized advice. The follow-up measurement helps to quantify the improvement made and increases intrinsic motivation to continue. A second measurement also provides commitment and aids motivation, as the second measurement is anticipated. To learn more about how Firstbeat Lifestyle Assessment can work in your business, download the Firstbeat Guide to Supporting Modern Workforce.